Weekend mornings find me with a hodgepodge of leftovers--and usually little time or energy for lengthy, breakfast prep. 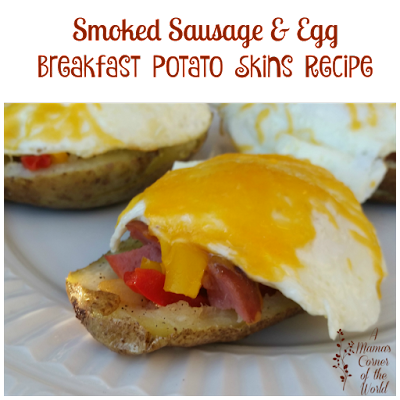 While these breakfast potato skins are loaded with flavor; they are actually quite fast and easy to make--and can be customized to suit even my resident picky eater. Today, some leftover smoked sausage, peppers and onions turned into a yummy breakfast in less than 20 minutes! Preheat the oven and prepare a baking sheet. Preheat the oven to 350 F and use a nonstick baking sheet. Prepare the potatoes. Sometimes I used leftover baked potatoes from the week for weekend potato skins. If you do not have leftovers on hand, simply wash the potatoes, pierce the skin in several spots, and either wrap with a paper towel and microwave for 8-10 minutes until "baked" or bake in the oven. Slice the baked potatoes in half lengthwise, allow to cool slightly and scoop out the potato--leaving about 1/4 inch of white potato remaining with the skin. Season the potato skins. Brush the potato skins (all the way around) with olive oil. Sprinkle with garlic powder, salt and pepper. Fill the Potato Skins Divide the smoked sausage and peppers and onions evenly between the four potatoes. Place the potato skins on the baking sheet and bake in the preheated oven while the eggs are frying in the next step. Fry the eggs. In a medium skillet, melt 2 tsp. Butter and 2 tsp. Olive Oil and heat until hot. Break the eggs into the pan and fry eggs, flipping once, to desired doneness. 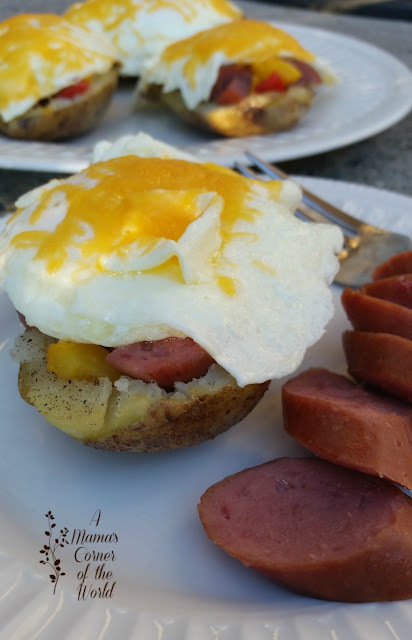 I like runny yolks for these eggs to top the potato skins; but, you could certainly fry the eggs to a hard center if you prefer. Finish the Breakfast Potato Skins. Top each stuffed potato skin with one fried egg and 1/4 of the shredded cheddar cheese. Bake and Serve. Bake for an additional 4-6 minutes or until cheese melts. Top with sour cream, chives, and tomatoes, if desired, or simply serve with whole grain toast and fruit. Notes: I love making these with random leftovers! Sometimes, I have a serving of ham, a slice of bacon, turkey sausage or simply a lot of mushrooms and random veggies. Each potato skin can be loaded with individual meats and vegetables without really affecting the ease of preparation or the cooking time. Please note that we may receive slight compensation from affiliate links within our posts.